Need a GPS? Use your smart phone! Tasmania is a fabulous destination for lovers of the natural outdoors. With its amazing World Heritage National Parks, stunning rain forests and the hundreds of hiking tracks that always leads you to a magnificent destination, it is not surprising that there is an increase of hikers wanting to see it all. All that joy of seeing Tasmania's beautiful and natural landmarks can soon turn to dismay if you get lost. And it's very easy to get lost even on popular tracks - one wrong turn and before you know it, you're not on the track anymore, not knowing where you are. I once got lost just 50 metres from the road, encased in thick forest and not knowing which direction I should head in. My saving grace that day was my GPS. For hiking, I would argue a GPS is a 'must have' item that you should carry with you. When I go hiking, I always carry a GPS, and I always record my hike. The reason is, if I ever get lost, I can retrace my steps by using my GPS to get me back on track. Many GPS units also have detailed topographical maps that clearly show where you are currently located. It's a brilliant tool for seeing where you're going, how far away you are from your destination, and how far you've hiked. GPS units can also be used to guide you to your destination. Which device is best for you? A dedicated GPS unit is always a good option. Manufacturers like Garmin and Magellan produce terrific high quality handheld GPS units specifically designed for hikers and mountaineers. These devices are rugged, often waterproof, and have a relatively long battery life as well. A good hand held GPS will set you back a minimum of $150 (Australian dollars) and increase in cost depending on the features they offer. Until recently I used a Magellan eXplorist 610 and it was a magnificent device for recording my travels. I can honestly say that using that GPS prevented me from getting lost in the wilderness many times over. The few hundred dollars I paid for it was a small price to pay for my well being. But, I don't have $$$ to spare! I see a lot of younger people walking around our forests and enjoying the scenery. 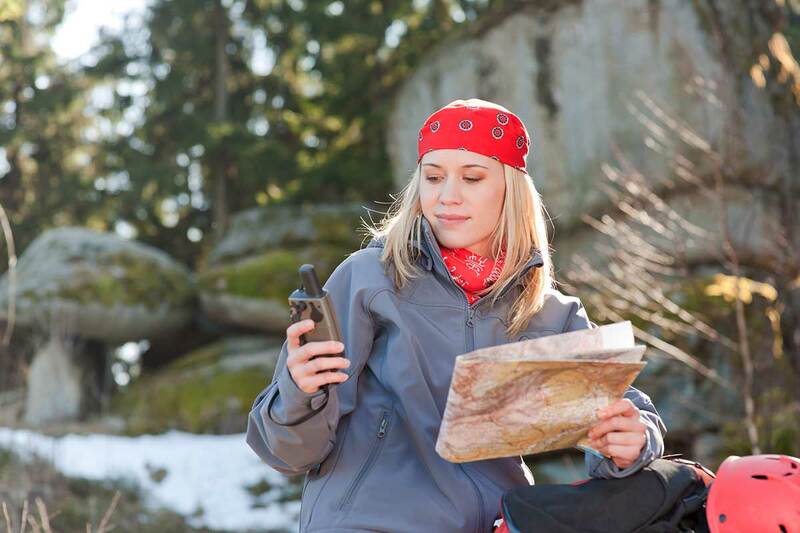 Most are carrying their smart phone, but do not have a dedicated GPS. Sometimes, the cost of a GPS is the reason they do not have one. Thankfully there are mobile phone apps that turn your phone into a GPS. Your phone's GPS does not need mobile phone reception. Click the Avenza Maps link above to find the correct version of the app for your mobile device. Alternatively, use the App Store for iPhones and iPads or Google Play for Android devices to download and install Avenza Maps. Your mobile device will advise you that Avenza Maps will need to access key areas of your device. Click 'Allow' for each. To use Avenza Maps you must have an account. This is at absolutely no cost, so go ahead and register. Once registered, sign into the app. You will be greeted with a link titled 'Getting Started' and is worth having a read. Click on the Store icon to download or purchase maps. Once the store opens, click on Topographic. A map of the world will open, usually displaying the country you are currently in. Zoom into the region you want to download maps from. Pins on the map will begin to display showing you available topographic maps you can download. By pressing the icons, the name of the map will display (see the screen image above). Click on the information icon next to the name to download the map. The Maps Details page will provide you information about your topographic map which you can download. Tasmanian Topographic maps are completely free to download and use. Click on the Free button, and then download you map. On the navigation bar, click on the Maps icon. All maps you download will be placed in this section, and at anytime you can open up the map. If your current GPS location is within the GPS bounds of the map, it will display on the map. At this point, you can add Placemarks (a bit like waypoints) onto your map, or click on the Spanner icon to start recording your hike. Remember - keep safe when hiking in Tasmania. Maps for your entire country you live in are preinstalled. Before you commence your hike, turn off Wi-Fi and Bluetooth on your mobile phone. Alter the Settings of Avenza Maps to ensure the screen does not stay on when in use. Carry a battery Powerbank that can be used to charge your phone when you're hiking. Powerbanks hold enough charge to recharge your smart phone multiple times before the powerbank needs to be recharged. They can be purchased for around $50.